It is curious how we view safety. In Britain, the horrible Politically Correct culture, assisted by the ambulance-chasing brigades (who I think of largely as get-rich-quick people) have driven us to a state of impasse. Sports Days are cancelled for fear of prosecution, allegedly because the local cats use the sand-pit as a toilet, but I suspect that the real reason is the consequence of the little dears getting tired¹; annual Carnivals with histories going back a hundred years are now scant because of the mandatory insurance that makes them too expensive to run; fear of AIDS makes would-be first-aiders more than reluctant: so our society is made much the weaker by this state of affairs. In Germany, there is a legal requirement making any nearby adult recognise an obligation to assist at an accident; this results in a social responsibility I would wish returned to Britain. Indirectly this degradation is one of the supplementary reasons for looking to live elsewhere. The image of China as portrayed in Britain is one in which there is no care for the individual. Witness the press cuttings about safety in construction. Little is said in such articles about the level of education of said workers, their desperation to hold any employment and the consequential lying about skill, understanding, education or ability – and (thence) the appalling rates of pay. Yet the Chinese construction industry can teach an awful lot to European firms; it is China that has the Olympic facilities ready most of a year early, unlike all the recent western events. Here, it is normal to spend only a year going from inception to installation; the limitation to the speed at which a building will go up appears to be the curing rate of concrete. The construction industry in China employs similar numbers of men and women – where else would that be true? Safety is a perception, not a fact. Adventure² is a balance between the perception of risk and the excitement gained from trespassing into a zone of danger, but it is still the perception of that danger which governs the exhilaration. In the hills, an ascending path can be judged entirely safe in a mist, but when it clears to show a scree below for a thousand feet, people suddenly become nervous. Some ex-Shiplake readers will recognise that shared moment. 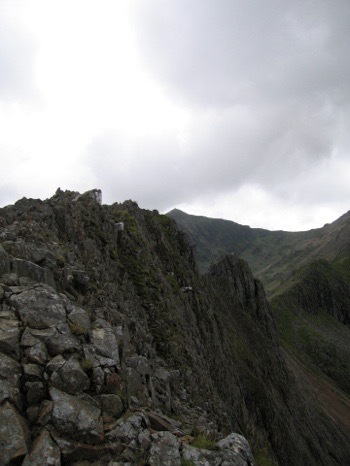 A path which is as wide as three boots is fine on the flat but is not when it is the entire width of a ridge (Crib Goch). One as wide as your shoulders with a vertical drop on one side will have many hugging the opposite and sheltering wall. In China, things are different (which is why I write at all). I have an outright refusal to allow cricket because “it is dangerous”, which I take to mean that no-one knows how to catch a cricket ball. 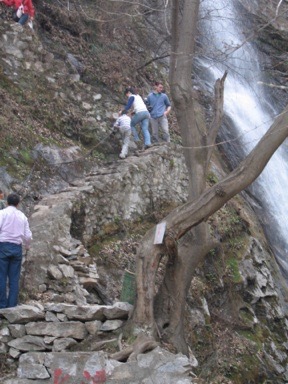 In the hills, stepping off the obligatory path (in Shaanxi) causes an instant and panicked concern, about which more later. The US is considered a ‘dangerous’ country to visit; students will apply instead to Canada because of this. Similarly, the perception of Britain as a dangerous place makes its image—as a place to study—suffer damage. Since in the UK the sale of education has overtaken the returns from selling arms, please tell your local educators this and encourage everyone to tell their MPs. Or sell their MP5. A visit from a Cambridge admissions officer revealed the unlikely statistic that fully half of all postgraduates there are Chinese, so some of that idea is dispelled. was to pass each other anyway. What risk? 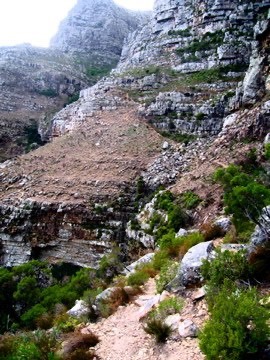 Above left, a narrow path, at the Cape in RSA; Above right, Pete, inter alia, not far from Xi’an; Below left, on Snowdon. Places where we would have a conniption fit at the prospect of taking small children is of no consequence here. Indeed, all the fears found in Britain of making the great wild outdoors more accessible by addition of paths are demonstrated here. The path exists, so assumptions of safety are made; the idea of being sensibly equipped runs to carrying a water bottle (in your hand). A weatherproof is a foreign idea, as is sensible footwear; so wearing or carrying either is not going to happen. I went out in the snow and my colleague was wearing trainers, no hat or gloves, no pockets, no bag of gear at all. Yet in Britain we decry anyone stepping onto a hill without ‘proper’ gear. My attitudes are seen here as totally unnecessary, more than a little strange and are likely to be passed off as carrying weight to slow me down. I have seen walking sticks used, but sensible footwear is rare. 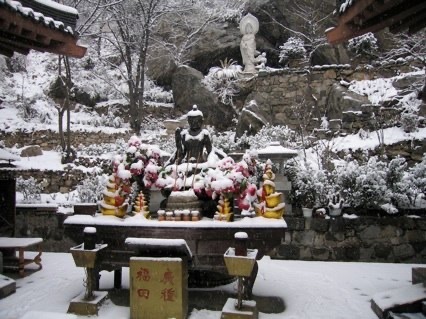 See Huangshan for some example pictures taken more than a year later in a different part of the country. This is walking of a different style and standard from any British experience. 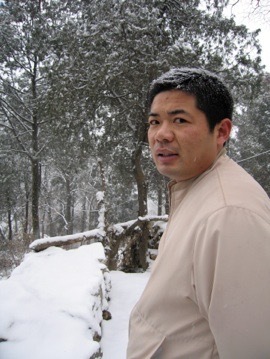 Below Gong Wei Fang out for a walk in the hills, and what we went to see. I wish to use the mountains for recreation, meaning walks of more than a part-day duration. The paths apparently go far enough but are likely to include buildings in unlikely places (monasteries, probably). So I am no nearer discovering the ‘form’ for camping, the likelihood of bears, poisonous snakes or insects, even the acceptable habits of long-distance walkers. Compasses and maps, obligatory in the UK, are considered irrelevant here (there is only one path, so why would you want one?). Cleaning the school last week, a task done (badly) by the children, involves all sorts of activity forbidden in the UK, such as climbing on desks and chairs, besides unheard of activity such as becoming dirty, smelly or useful. Mind, there are no cleaning agents, just a damp cloth, a huge mop and a brush that looks like it came off a tree last week. Much higher standards are set at CCF Camp!! I watched an electrician reach a faulty switch by putting a school stool (about a foot cube in volume) on top of another. Judging by the observed response, this is entirely normal, as was seeing children standing in windows (on the cill, and outside and, Oxford comma, several floors up). Yet these are the same people who have a fit when I suggest I might go wander off the path on a hill. Sanitary considerations are similar. Our school classrooms are, by British standards, filthy and rich with potential for disease. The sanitary standards reach—or don’t—to the toilets (washroom or restroom, here, though they are neither). Urinal walls, and the vitrified shower bases that pass for the other facility—all with doors that fail in their purpose—are also cleaned, by staff this time, but still with only mop and water. Result: an accretion of excretion, unsanitary sanitary-ware, a stench trench. In warm weather the whole corridor, despite being open to the elements, is odiferous such that even the anosmic (me) can detect a problem. A whole new meaning to ‘filthy rich’ environment. China has been affected by disease; the reaction to the bird-flu outbreak in 2006 was to close schools (that is virtually unheard of) for a month; I comment elsewhere about famine, but there was a smallpox outbreak in the Fifties that killed 35,000. The country has never been decimated by plague, but the Japanese left behind some nasties in the local rat population when leaving Nanjing at the end of the last war, which killed a similar number. The people take cleanliness seriously, but only by washing, and rarely with soap. Deodorant is foreign; chlorine and bleach are available but not in use in public buildings. To European or American eyes this is unsafe, but to a Chinese it is normal – and therefore acceptable. As one child said to me about education, “Just because we have had an education system for 3000 years doesn’t mean it shouldn’t change”.³ The same applies to standards of cleanliness. Mind, some of the reluctance to use chemicals is environmental, for China is very much more conscious of poisoning the planet than any typical westerner appreciates; if everyone used chlorine bleach the damage would be colossal, although things might be cleaner in an immediately local sense. One wonders where the balance point lies. Cultures are different. Understanding requires communication and discussion but not demands of one party by another; understanding requires sufficient listening for comprehension to occur and for misconceptions to be banished. It is difficult to be receptive when agitated; diplomacy may be the lair of practised liars, but control of emotion is necessary for successful communication in moments of cultural stress. It continues to amaze me just what offends one’s cultural standards and how small an issue can set off one’s temper. 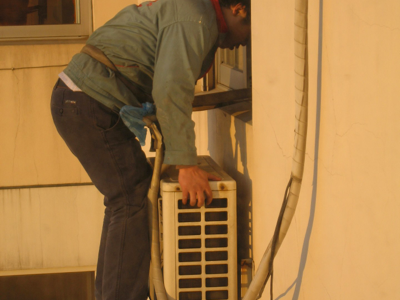 Picture at the top: 13 floors up and trying to lift the a/c unit. The safety rope is only fastened to his pal on the inside, who is fixed to nothing but his wallet and phone. 1 Sports Days produce competition, and this was deemed A Bad Thing at my kids‘ primary school in Oxfordshire, I was asked politely not to attend future parent-teachers games evenings (my team won at rounders—of course it did, I was teaching Games—but the staff didn’t like being told to get a move on and be asked where their sense of competition had gone). Sport makes kids tired—if they join in at unaccustomed exercise —and that makes them difficult to live with when the get home. More sport raises the energy levels, sometimes makes them more aggressive (for just as many it has the opposite effect); parents don’t like the consequences, especially those parents who don’t really know why they have kids (they so get in the way of your career, don’t they?). I recommend Boarding School. No, really, I do. 2 “Adventure is perception of risk” heard on an Army day in the hills. Good phrase.